Sourav's - The Food Pavilion is Koltata's first four-storeyed most happening multiplex restaurant designed by renowned Mumbai-based architect Kapil Bhalla and was just completed in five months. 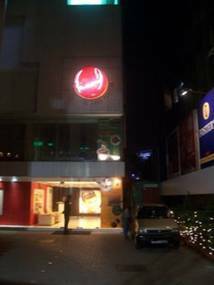 Sourav’s – Kolkata’s most happening multiplex restaurant has four restaurants under one roof.At Sourav’s you get a multiplicity in the menu that’s well-divided among all the floors. One Day is 24 hrs Coffee Shop, located on the first floor, symbolizes fellowship and harmony and can accommodate guests over-century with live band every evening. Over Boundary is a multi-cuisine restaurant, located on the second floor. It show the dynamic years that went into the making of the Indian EXCAPTAIN. The haven of experimental world fare, caters cross-country cuisine and the top pick from the global palette, predominantly Chinese. Maharaj is a 70-seater flamboyant restaurant that provides a complete family experience; it serves royal food from North India, Kashmir and Afghanistan. Prince of Cal is the most authentic lounge bar that showcases the spirit of cricket laced with the Glitterati of glory and melody with an active light having 12,000,000 colors combinations from Zumtobel, Germany. 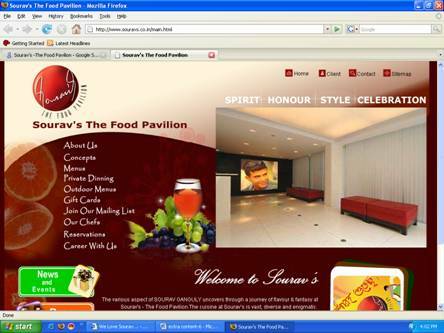 The various aspect of SOURAV GANGULY uncovers through a journey of flavour & fantasy at Sourav's - The Food Pavilion.The cuisine at Sourav’s is vast, diverse and enigmatic. Amid a host of Pakistani and Indian cricket players, master batsman Sachin Tendulkar had cut the red ribbon and opened excaptain Sourav’s Kolkata’s most happening multiplex restaurant, located in the city's busy Park Street. SOURAV GANGULY said during the inauguration of Sourav’s: "It was a long time dream of mine to open a restaurant in my Kolkata where different types of cuisine catering to people with different tastes could be served." 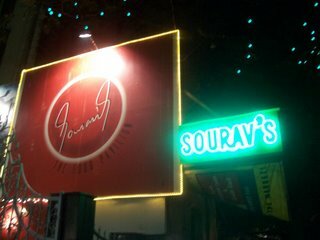 Though the city misses SOURAV GANGULY when he is out, Sourav’s pays off a lip-smacking tribute by feting guests with out-of-the-ordinary dishes.Sourav’s is run by young and energitic professionals, associated with the hospitality industry for years. In a very short span of time Sourav’s has achieved huge success as far as the outdoor catering is concerned. Sourav’s has catered to Rs.250 American Marines for the period of one month for breakfast, lunch, dinner and evening & midnight snacks during the joint exercise of US and Indian Air-force. The food that was served was of highest quality, hygiene and strict as per the Strict US Food norms. Sourav’s had with pride served for Rs.150 Singapore Air-force Personal for one month at the Kalaikunda Airbase. After completing this successfully, Sourav’s has achieved a three-year contract with the Kalaikunda Airbase. Sourav’s also specialize in marriage catering with specialized cooks.